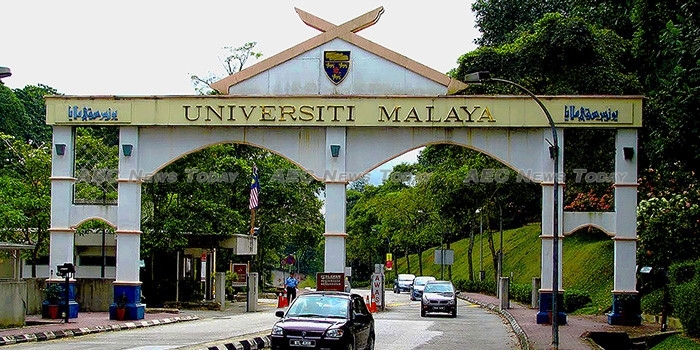 After storming into the 2018 Times World University Rankings with a debut in the 351-400 grouping University Malaya (UM) continues to disrupt the Asean higher education scene, unseating Thailand’s Mahidol University (MU) from the top ranked university in Asean and taking the 27th spot globally in the Times Higher Education (THE) Emerging Economies University Rankings 2018. Leading 23 Asean universities into the top universities in emerging economies list this year UM is joined by six other Malaysian universities, with five filling positions in the top ten Asean emerging economies universities sub-list: Universiti Teknologi Petronas (UTP) (#3 / #77), Universiti Teknologi Malaysia (UTM) (#5/ #101), Universiti Putra (UP) (#6/ #108), Universiti Tunku Abdul Rahman (UTAR) (#7/ #114), Universiti Sains (US) (#9/ #135), and Universiti Kebangsaan (UK) (#10/ #151). Fellow Malaysian universities making it into the top Asean universities in emerging economies sub-list are Universiti Tenaga Nasional (UNITEN) (#11/ #159), and Universiti Utara (UU) which took the 23rd position in the Asean sub-list with a ranking of between 251 and 300 globally. Despite being dethroned from the top position in Asean, Thailand’s MU maintained its 76th position global ranking. The only other two Thailand universities in the top ten list of universities in emerging economies, King Mongkut’s University of Technology Thonburi (KMUTT) and Chulalongkorn University (CU), fell from number 91 and 117 globally last year to 92 and 126 respectively this year to fill slots four and eight in Asean in 2018. While ten Thailand universities made it into the list of top emerging economies universities in Asean only Suranaree University of Technology (SUT) saw its global ranking improve over last year, rising from 192 in 2017 to 177 this year to fill position number 13 in Asean. Those that fell, or remained stagnant, were King Mongkut’s Institute of Technology Ladkrabang (KMITL), which fell from 145 to 181 globally, Chiang Mai University (CMU), which fell 30 positions globally to finish at 195 globally, Kon Kaen University (KKU), Kasetsart University (KU), and Prince of Songkla University (PSU). 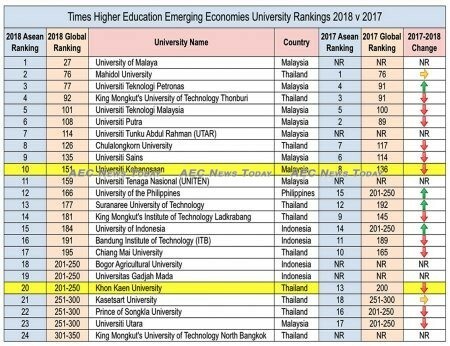 Introducing ‘fresh blood’ for Thai universities to the list was King Mongkut’s University of Technology North Bangkok (KMUTNB) which debuted in the 301-350 band globally to become the 24th ranked Asean listing in the 2018 emerging economies university list. Whether it has what it takes to mimic the spectacular rise of UM in next year’s list is yet to be seen. Joining the list of universities in emerging economies to see its ranking improve in the 2018 list was University of the Philippines (UP), that country’s only entry in the list this year, which went from the 201-250 band last year to 166 this year, to fill position number 12 in Asean. Also moving up in the global rankings, but not in the Asean sub-list, was the University of Indonesia (UI) which moved from the 201-250 band last year to rank 184 globally this year, but slipped one position in the Asean list to 15th this year. 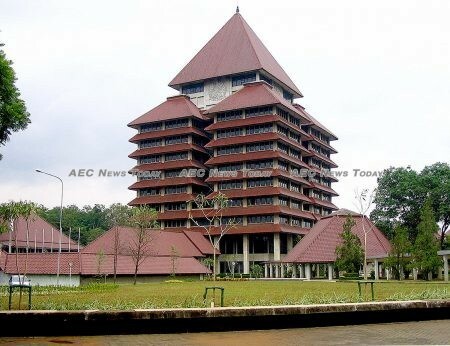 Indonesia’s next highest ranked university in the emerging economies university list is Bandung Institute of Technology (BIT), who tumbled from 189 in the 2017 global rankings and 11th in Asean to 191 and 16th respectively this year. Making strong debut entries into the Emerging Economies University Rankings 2018 list are Indonesia’s Bogor Agricultural University (BAU), and Universitas Gadjah Mada (UGM), who leapt into the 201-250 band globally, to take positions 18 and 19 in the Asean list of emerging economies universities for 2018. To say that the addition of new entries into The Times‘ ranking system has had a disruptive effect on the global and Asean emerging economies university rankings would be an understatement. For many years the upper parts of the Asean sub-list has been dominated by Thai universities, education administrators there well aware of the value of international rankings and accreditations. With more universities in Malaysia and Indonesia now participating in the ranking system Thai universities in particular are going to need to pick up their game if they are even going to continue ranking in the top ten Asean universities in emerging economies for much longer, or any other Asean higher education top ten list. The 2018 Emerging Economies University Rankings is also a sad indictment on the state of higher education throughout Asean. Only 24 universities from four countries made it into the Times Emerging Economies University Rankings 2018 list. “To improve, institutions need to focus heavily on developing their research capacity and strengthening their international outlook,” he added. Commenting on UMs success, vice chancellor, Abdul Rahim Hashim said the university will “continue to focus on strengthening its fundamentals through the many phases of its Strategic Plans. UM aims to improve its linkages and collaborations with strategic industries and international partners,” he added. The Emerging Economies University Rankings 2018 survey covered 378 universities from 42 countries across four continents classed as emerging economies by the Financial Times Stock Exchange (FTSE) and used the same 13 performance indicators as the THE World University Rankings to judge institutions on their main missions: teaching, research, knowledge transfer, and international outlook by examining each university’s strengths and capabilities.